Washi, a new park guard, on duty near front-line skirmish with the criminal Thoms. 7 February 2016 — It was well after dark when I got a call from Alatcho. 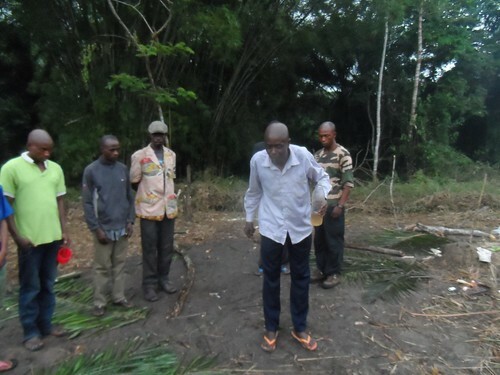 He and four others had arrived at the ICCN (parks) office in Kindu from Dingi. They were now park guards. Washi on the far left and Altacho on the far right with three other new guards from the north of park are standing in front of our TL2 office in Kindu. It was too far for them to go home in the two week break after training. 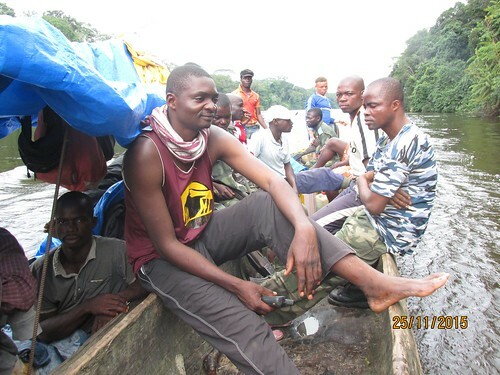 Two months earlier Alatcho, along with Boni and 4 others had come South, up the Lomami River from Obenge. For the last 3 to 6 years they have been part of the TL2 teams, identifying animal sign, burning illegal poachers’ camps, using compass, GPS and satellite phone. They all know the need for park guards; they have all been unarmed and under fire from poachers and criminals. They were ready to become part of the answer. Boni coming up river to the guard training. He had been posted in Obenge. Just beyond Boni, in the same of the two lashed dugouts, and looking at the camera is Lesole. He is from a village where Thoms and his gang raped over 130 women and girls over a two week period while the men were forced into labor. 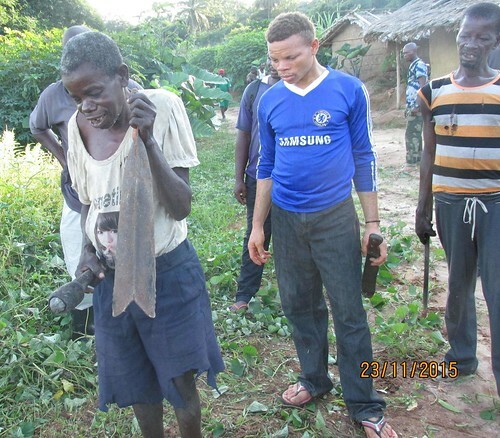 In 2012 Boni’s hand was slashed with a machete. 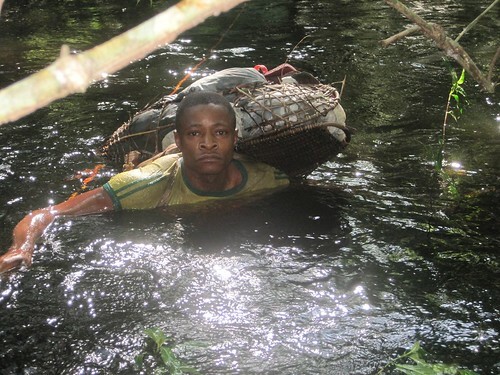 He had jumped an armed poacher and was struggling to disarm him when another poacher came up with a machete. Our team, unarmed, succeeded, but at cost. Alatcho receives a shot of local liquor to drink and spit on the grave of Kapere. 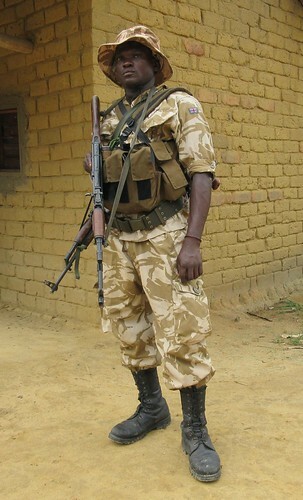 Bongweli, also now a guard, helped clean Kapere’s grave in Obenge. 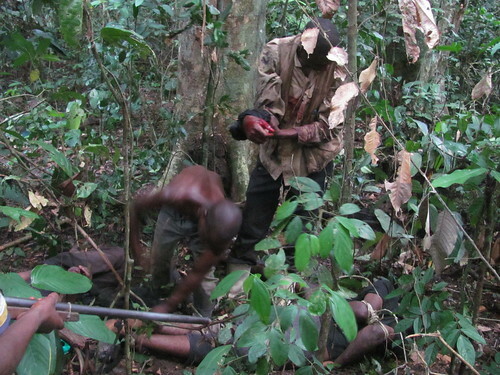 Kapere was beaten to death in 2013 by Thoms. 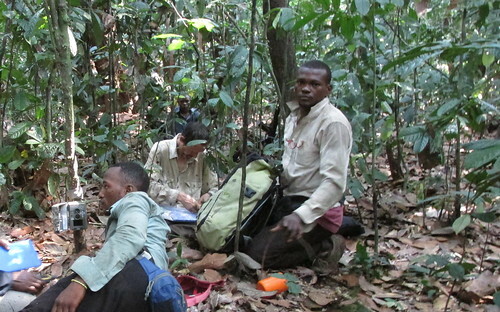 Washi helps to check camera traps in the forest south of Obenge. On this trip their dugout was shot at by Thoms’s band and one person injured. Guard training started like any community event: Tradition and Friendly Debate. ICCN, the park service needed a site for the training, a large area. The community and the ancestors officially chose and opened the site. 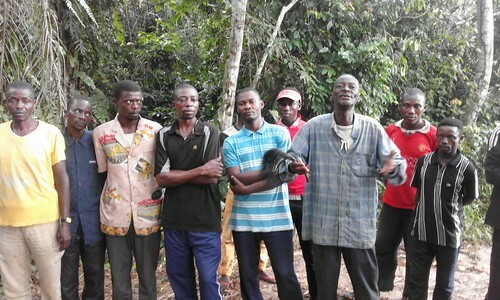 The elders of the Bangengele gathered in the village of Dingi. The chief spat his blessing on the ground. The training could begin. 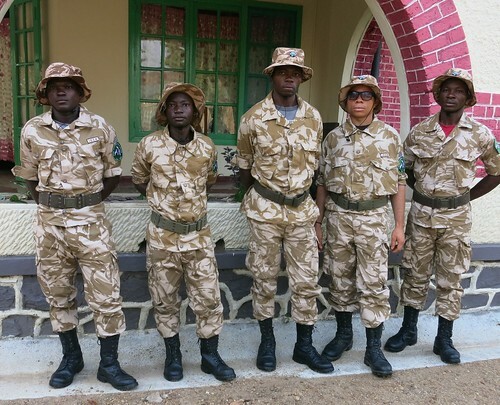 The guard training started the first week of December in the southern buffer zone, near the village of Dingi. 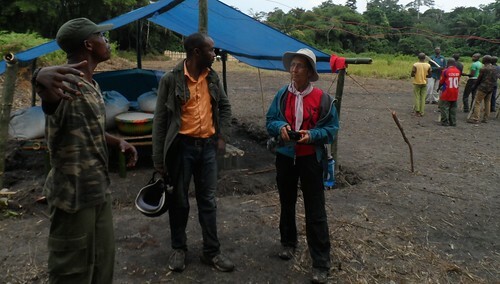 The trainees from the north were with colleagues from the south. 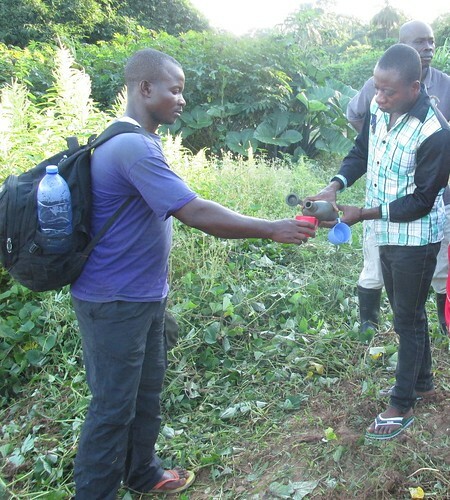 The ICCN recruited mainly from our TL2 teams including those based at Katopa, at Oluo and also at Bafundo. Bemba, a recruit from our Oluo team, knows the park well. Here he is swimming the flooded Luidjo during a patrol. 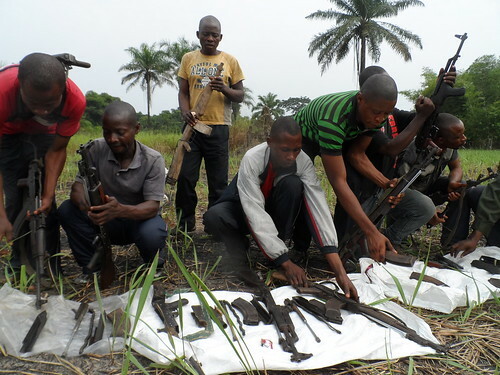 Bemba here at the guard training, in green striped shirt,is learning to clean and assemble a rifle. The training got underway with the new ICCN staff and with a few chosen army officers. Benjamin the new instructor for LAB (Lutte Anti-Braconnage or Anti-Poaching Unit) started the first couple weeks of drill. Not quite in sync here. Boni, who became the leader of the candidates, is in push-up on the far left. Ben is walking along the ranks. At this point the guns are wooden dummies. 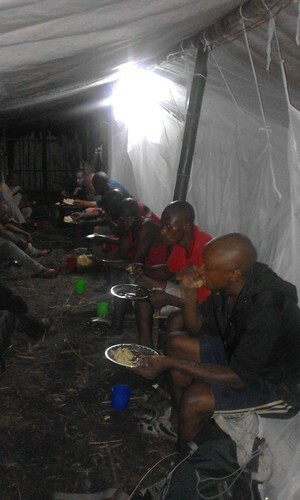 Evening meal in the tent-dormitory. Three female candidates have their own tent. Ben explains the steps of the training when I visit with Matthieu. Boni leads the drills in the background. The guards will be active on the ground by the end of this month, February 2016. —the training photos in this post by Leon Salumu. Thanks, Leon! This entry was written by Terese Hart, posted on 2016-02-18 at 8:55 pm, filed under Law and Order. Bookmark the permalink. Follow any comments here with the RSS feed for this post. Trackbacks are closed, but you can post a comment.